The miniseries 'The Pillars of the Earth' stars Natalia Woerner (l.) as Ellen, Rufus Sewell (c.) as Tom and Eddie Redmayne as Jack. "Pillars of the Earth" may illustrate both why the miniseries has been dormant in recent years and why, if it can be done well, it deserves to return. "Pillars," an adaptation of Ken Follett's dense and engrossing blockbuster novel set in 12th-century England, is done beautifully. The performances shine, starting with Ian McShane's sinister Bishop Waleran Bigod and continuing through Natalia Worner's Ellen, who brings feminist sensibilities to an age when they were not only unwelcome, but unthinkable. Summarizing the plot of "Pillars" would be like summarizing the plot of the Old Testament, and the producers here have kept a firm balance between maintaining the scope and complexity of Follett's tale and rendering it comprehensible to TV viewers. Tonight's first episode runs two hours. The next four nights will be an hour apiece, followed by a two-hour finale. By the end of tonight's episode, or perhaps a bit before, the lineup is fairly clear and we have some sense who is on whose side in the struggle for control of a fragmented land. Some of the characters reveal themselves earlier, but the interplay between factions and individuals takes a while to develop. We also inevitably lose a few characters along the way, this being an age when life was shorter and cheaper. Despite the skill of the producers and the actors, it does take a while to sort out all the forces that sought control of a country technically committed to its royal family, but in day-to-day life more often guided by the church. Royalty and clergy ritualistically acknowledge each other's official power, while they quietly act in the full knowledge that "official" can be a deceptive notion. Matthew Macfadyen is particularly strong as the troubled Prior Philip, a genuinely reverent man whose dream of a mighty cathedral requires him to make accommodations and take action with which he feels uncomfortable. 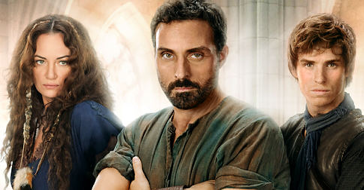 His instrument for this cathedral is Tom Builder (Rufus Sewell), a man with a gift and no position or power. He therefore must navigate carefully and have some significant luck if he is to become the man selected to design and build this shrine to the Lord. Young blood includes Jack (Eddie Redmayne), who is a good man, and William (David Oakes), who is not. William gets it from his mother, Regan (Sarah Parish), who is as nasty as the scar on her face. This isn't "Cupcake Dreams." It isn't even "Blood and Sand." This requires commitment, it requires paying attention and it has few cartoonish interludes to give the audience a breather. It also reminds us the value and satisfaction we can find in a complex production executed well.